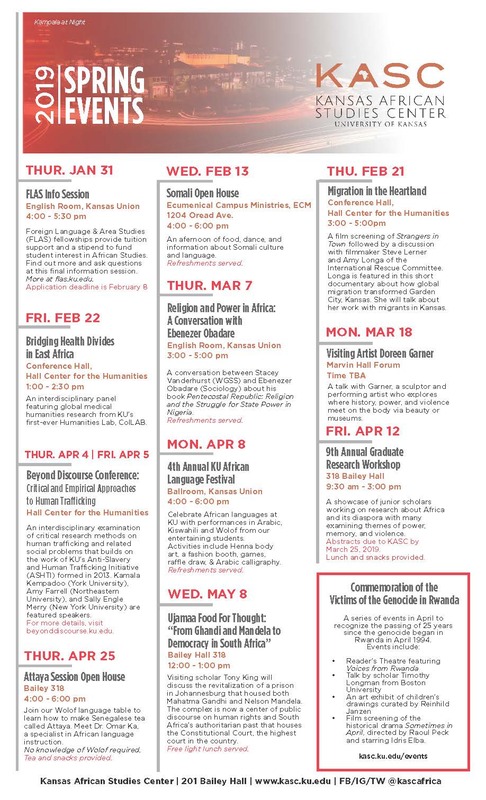 Throughout the month of April 2019 KASC and partners across KU and the Lawrence community will host events to commemorate the victims and survivors of the 1994 genocide in Rwanda. UN Secretary-General António Guterres has called for the world to “reaffirm our commitment to upholding the equality and dignity of all” as “anti-Semitism, anti-Muslim bigotry and other forms of hatred, racism, and xenophobia” are on the rise. When the plane carrying the Hutu president of Rwanda was shot down in early April 1994, extremist Hutus began a wave of killings against the nation’s Tutsi minority and moderate Hutus. This conflict resulted in the deaths of up to perhaps one million Rwandans. Rwanda’s own national commemoration and day of mourning, called Kwibuka, which translates as “remembrance,” is held annually on April 7th. April 16th: A Conversation about the Genocide of the Ovaharero People of Namibia led by Dr. Ngondi A. Kamatuka, Director of the Center for Educational Opportunity Programs in the Achievement and Assessment Institute at KU, to reflect upon other genocides in history. This will be held in partnership with the Max Kade Center at the University of Kansas directed by Dr. Lorie Vanchena, Associate Professor in the Department of Germanic Languages and Literatures. April 23rd: Film screening at the Lawrence Public Library of Sometimes in April, a feature film directed by Raoul Peck that tells the story of two brothers with differing loyalties during the Rwandan conflict in 1994. Starring Idris Elba.